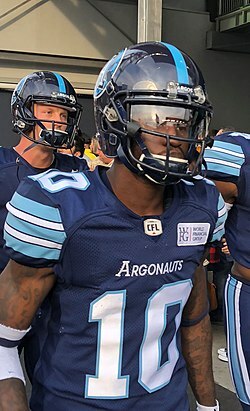 Armanti Edwards before a Toronto Argonauts game in 2018. Armanti Fredrico Edwards, Sr. (born March 8, 1988) is an American gridiron football wide receiver for the Toronto Argonauts of the Canadian Football League (CFL). He was drafted by the Carolina Panthers in the third round of the 2010 NFL Draft. He was the starting quarterback for the Appalachian State Mountaineers football team from 2006–09. In addition to leading the Mountaineers to consecutive NCAA Division I Football Championships (FCS) in 2006 and 2007, Edwards became the first quarterback in Southern Conference history to lead his team to four straight conference championships. He became the first quarterback in NCAA Division I history to throw for 9,000 and rush for 4,000 yards in a career, accomplishing the feat against Furman on October 31, 2009. Later in the season, he would become the first quarterback to pass for over 10,000 yards and rush for an additional 4,000 yards in a career. In the same week that Adrian Peterson set the NFL single game rushing record at 296, Armanti rushed for 313 on 31 attempts against Richmond in the playoffs at Kidd Brewer Stadium (12/7/2007). He is also the first back-to-back and two-time Walter Payton Award winner, given to the Football Championship Subdivision's most outstanding offensive player, receiving the award in 2008 and 2009. Armanti is the son of Deborah Anderson and Freddie Edwards. At birth, Edwards weighed 4 pounds 11 ounces and was delivered 10 days late. In September 2006, his father, Freddie, was convicted of a 2005 murder and sentenced to 30 years in prison. At Greenwood High, under coach Shell Dula, he was named to the Greenwood Touchdown Club/Index-Journal All-Lakelands Team. Edwards originally played wide receiver, but in his senior year, he moved under center. The transition occurred late in the recruiting process, and he drew some interest from New Mexico State, Memphis, South Carolina, and Vanderbilt. After only receiving an offer from New Mexico State, he decided to honor his commitment to Appalachian State, in part because they would let him stay a quarterback. Armanti Edwards graduated with a 3.3 GPA. Armanti Edwards led the Mountaineers to the FCS (formerly Division I-AA) National Championship in 2006 as a true freshman, beating the Minutemen of UMass 28–17. He finished the 2006 season with 2,251 yards and 15 touchdowns passing, and 1,153 yards and 15 touchdowns rushing. Edwards joined a select list as the fifth Division I player (Missouri's Brad Smith and Texas's Vince Young are among the others), and second freshman, to accomplish the feat of 2000 passing yards and 1000 rushing yards in one season. Edwards was named the Southern Conference Freshman of the Year at the end of the season. Edwards started the 2007 season by guiding Appalachian State to a 34–32 upset victory over fifth-ranked Michigan of the Football Bowl Subdivision on September 1, in a game that was named the "Biggest Upset of 2007" by Sports Illustrated. In the game, Edwards threw for 227 yards and three touchdowns while also totaling 62 yards and a touchdown on the ground. On December 7, in a semifinal playoff game against Richmond, Edwards set the single game FCS rushing record for a quarterback, rushing for 313 yards and 4 touchdowns on 31 carries. He also completed 14-of-16 passes for 192 yards and 3 touchdowns. Edwards had been mentioned as a possible candidate for the Heisman Trophy in the 2008 season. Edwards established himself as a threat through the air and along the ground, and garnered elite status within the division. He and the Mountaineers won a third consecutive national championship, beating the Delaware Fightin' Blue Hens, 49–21, in the championship game on December 14. He outplayed future Baltimore Ravens quarterback Joe Flacco in that game. Edwards warms up prior to a game against Jacksonville University in 2008. Edwards (#14) with Pierre Banks (#31) in 2008. The Mountaineers began the 2008 campaign against the LSU Tigers, the first time defending FBS and FCS champions have met to open the season. However, LSU prevailed 41-13, with Edwards accounting for 216 of Appalachian State's 472 total yards. Edwards accounted for 440 yards of total offense, becoming the Southern Conference's all-time leader in yards with a 70–24 victory over the Wofford Terriers on October 31. On November 15, the Mountaineers clinched the Southern Conference championship, joining West Virginia (1953–56), Furman (1980–83) and Georgia Southern (1997–2002) as the only programs to win four straight titles, with a 24–16 victory over the Elon Phoenix. In his 36th career start, he became the 26th FCS player in history to surpass 10,000 yards of career total offense in Appalachian's win over South Carolina State in the First Round of the 2008 playoffs. He was named the 2008 Southern Conference Offensive Player of the Year, and was the winner of the 2008 Walter Payton Award, given to the top FCS offensive player. Edwards threw a career-worst 5 interceptions in a quarterfinal loss to eventual tournament winner, Richmond, denying Appalachian State their 4th consecutive FCS championship. Before the start of the season, Edwards was involved in a lawn mowing accident, resulting in a trip to the hospital where he was treated and released. The injury sidelined him for the season opener against the East Carolina Pirates, a game which the Mountaineers would lose 29–24. With a 27–10 victory over Elon on November 14, Edwards became the only quarterback in conference history to win four consecutive championships. Edwards's college football career ended on December 12 in a playoff semi-final game against the Montana Grizzlies. The 24–17 loss was the highest rated FCS postseason game ever broadcast according to Nielsen and the NCAA. The following day, Edwards graduated after just three and a half years with a degree in graphic arts. On December 17, in a landslide victory, Edwards received the Walter Payton Award making him the first ever two-time recipient of the award. Edwards at Bears training camp in 2014. Edwards was selected in the third round, pick #89, of the 2010 draft by the Carolina Panthers. Edwards could see the field at a variety of positions including wide receiver, kickoff returner, and quarterback in the wildcat formation. He was first activated in the 2010 season for the October 10 game against the Chicago Bears. After a 34-3 loss against New Orleans and the loss of Matt Moore to the injured reserve list, Coach John Fox hinted that Edwards would see more snaps at quarterback in practice. Edwards was named the emergency/third quarterback for the first time before the November 14 game at Tampa Bay, but did not see any game action. On December 12, Edwards featured at quarterback for one snap against the Atlanta Falcons completing a pass to fellow rookie David Gettis for no gain. The Panthers released Edwards on October 8, 2013. The Cleveland Browns signed Edwards on October 31, 2013. He was placed on the team's injured reserve on November 20. On December 23, Edwards was released by the team with an injury settlement. Edwards signed with the Chicago Bears on June 3, 2014. He was released by the team during final cuts on August 29, 2014. On February 24, 2016, it was announced that Edwards had signed with the Saskatchewan Roughriders of the Canadian Football League. On May 27, 2017, Edwards was traded from the Roughriders to the Toronto Argonauts in exchange for offensive lineman, Peter Dyakowski. Edwards had a breakout season in 2017 for the Argos, playing in all but one regular season game, catching 83 passes for 962 yards with four touchdowns. In the playoffs he caught seven passes for 56 yards en route to winning the 105th Grey Cup. In January 2018 Edwards and the Argos agreed to a new two-year contract. ^ Andrew Mason (April 23, 2010). "After QB, Panthers target targets". Panthers.com. Archived from the original on April 28, 2010. Retrieved April 24, 2010. ^ a b Appalachian Sports Information (November 14, 2009). "Mountaineers Clinch Fifth-Straight SoCon Title". GoASU. Retrieved November 19, 2009. ^ Appalachian Sports Information (October 31, 2009). "Mountaineers Rout Furman, 52-27". GoASU. Retrieved November 19, 2009. ^ Jason Gilmer (November 19, 2009). "Did He Just Do That?". High Country Press. Archived from the original on July 11, 2011. Retrieved November 19, 2009. ^ "Edwards takes it: ASU quarterback wins the Walter Payton Award for the second time". Winston-Salem Journal. December 18, 2009. Archived from the original on August 26, 2012. Retrieved April 4, 2010. ^ a b c "Armanti Edwards wins 2009 Walter Payton Award". The Sports Network. Archived from the original on April 4, 2011. Retrieved December 17, 2009. ^ Associated Press. "Edwards wins second Payton Award". ESPN. Retrieved December 17, 2009. ^ a b Thayer Evans (August 29, 2008). "A Father's Prediction Becomes a Son's Tribute". New York Times. Retrieved December 4, 2008. ^ Anthony Stalter (August 20, 2008). "Is Appalachian State's Armanti Edwards a true Heisman candidate?". The Scores Report. Archived from the original on December 6, 2008. Retrieved November 29, 2008. ^ Mark Schlabach (September 20, 2007). "Undersized and overlooked, Edwards shines at Big House". ESPN. Retrieved December 4, 2008. ^ Appalachian Sports Information (November 22, 2006). "Mountaineers Clean Up as SoCon Awards, All-Conference Teams are Announced". GoASU. Retrieved December 4, 2008. ^ "Biggest Upsets of 2007: No. 1 Appalachian State 34, No. 5 Michigan 32". Sports Illustrated. December 13, 2007. ^ Associated Press (December 8, 2007). "Edwards' dominating night puts Appalachian State in title game, 55-35 over Richmond". International Herald Tribune. Retrieved December 4, 2008. ^ Stewart Mandel (December 13, 2008). "Edwards for Heisman?". Sports Illustrated. Archived from the original on December 6, 2008. Retrieved December 4, 2008. ^ Appalachian Sports Information (December 14, 2007). "Thrice is Nice: Apps Rout Delaware For Third-Straight National Title". GoASU. Retrieved January 4, 2008. ^ Associated Press (August 30, 2008). "Edwards runs for 160 yards as Appalachian St. overwhelms No. 7 LSU". ESPN. Archived from the original on September 12, 2008. Retrieved September 22, 2008. ^ "Appalachian State Tops Wofford in Halloween Showdown". Southern Conference. October 31, 2008. Retrieved December 4, 2008. ^ "Appalachian State Clinches Fourth Straight SoCon Title". Southern Conference. November 15, 2008. Retrieved December 4, 2008. ^ Appalachian Sports Information (November 29, 2008). "Edwards' Record Day Propels Appalachian into NCAA Quarterfinals". GoASU. Archived from the original on December 4, 2008. Retrieved November 29, 2008. ^ Appalachian Sports Information (November 25, 2007). "Mountaineers Sweep SoCon's Major Awards, Place 14 on All-Conference Teams". GoASU. Retrieved December 4, 2008. ^ a b "Armanti Edwards wins 2008 Walter Payton Award". The Sports Network. December 18, 2007. Archived from the original on May 25, 2011. Retrieved December 21, 2008. ^ Steve Behr (December 19, 2007). "Armanti Edwards wins Walter Payton Award". The Watauga Democrat. Archived from the original on December 23, 2008. Retrieved December 21, 2008. ^ "Playoff roundup: Richmond dethrones Appalachian State". USA Today. December 7, 2008. ^ Appalachian Sports Information (December 15, 2009). "ASU-Montana the Highest-Rated FCS Broadcast Ever". GoASU. Retrieved April 24, 2010. ^ "Edwards and Hollinquest Earn League Honor". Southern Conference. June 1, 2010. Retrieved June 1, 2010. ^ a b "2009 SoCon Media All-Conference Football Team Revealed". Southern Conference. November 25, 2009. Retrieved November 25, 2009. ^ a b "SoCon Announces 2009 Coaches All-Conference Football Team". Southern Conference. November 24, 2009. Retrieved November 25, 2009. ^ Appalachian Sports Information (November 22, 2006). "Mountaineers Clean Up as SoCon Awards, All-Conference Teams are Announced". GoASU. Retrieved November 25, 2009. ^ "SCSMA Announces 2006 Football All-Conference Teams". Southern Conference. November 22, 2006. Retrieved November 25, 2009. ^ "SCSMA Names 2008 All-Southern Conference Football Teams". Southern Conference. November 26, 2008. Retrieved November 25, 2009. ^ "SoCon Football Coaches Select 2006 Annual Awards". Southern Conference. November 22, 2008. Retrieved November 25, 2009. ^ "Coaches Select 2008 All-Southern Conference Football Teams". Southern Conference. November 25, 2008. Retrieved November 25, 2009. ^ "2007 Coaches All-Southern Conference Football Team Announced". Southern Conference. November 19, 2007. Retrieved November 25, 2009. ^ Appalachian Sports Information (November 12, 2006). "Edwards Earns National, SoCon Recognition After Record-Setting Performance". GoASU. Retrieved November 25, 2009. ^ Appalachian Sports Information (November 2, 2009). "Edwards Grabs Record-Tying Fifth SoCon Freshman of the Week Award". GoASU. Retrieved November 25, 2009. ^ Appalachian Sports Information (December 17, 2009). "Edwards Wins Second-Straight Payton Award". GoASU. Retrieved December 17, 2009. ^ Sommers, Erik (September 19, 2017). "CSR exclusive interview with former Panthers receiver Armanti Edwards". Cat Scratch Reader. Archived from the original on September 22, 2017. Retrieved September 22, 2017. ^ Wesseling, Chris (October 8, 2013). "Armanti Edwards to be released by Carolina Panthers". NFL.com. Retrieved August 17, 2014. ^ "Browns Sign WR Armanti Edwards; Big Plays to Come?". ^ "Browns Sign WR Josh Cooper; Armanti Edwards to IR". ^ Wood, Jesse (December 23, 2013). "Cleveland Browns Waive Armanti Edwards". HCPress.com. Retrieved August 17, 2014. ^ Alper, Josh (June 3, 2014). "Bears sign Armanti Edwards, Micheal Spurlock". NBCSports.com. Retrieved August 17, 2014. ^ Gantt, Darin. "Bears part ways with receiver Armanti Edwards". Pro Football Talk. Retrieved August 29, 2014. ^ "Argos acquire WR Edwards in trade with Riders - Toronto Argonauts". May 27, 2017. ^ "Argos re-sign WR Edwards to 2-year deal - Article - TSN". TSN. January 15, 2018. Retrieved January 15, 2018. ^ "Armanti Edwards - CFL.ca". Retrieved January 22, 2017. Wikimedia Commons has media related to Armanti Edwards.